Curtain wall constructions are one of the most applied facade constructions today. Independently attached to the primary load bearing structure of the building they protect the building’s interior from external climate conditions and allow great design freedom. With continuously rising requirements in terms of energy savings the constructional principle has reached its limits and strategies for improvement are needed. Incrementally evolved over time it is closely related to the architectural design and building processes. Based on literature research and stakeholder interviews the dissertation maps out the traditional and craftsmanship related facade design and construction process currently employed. 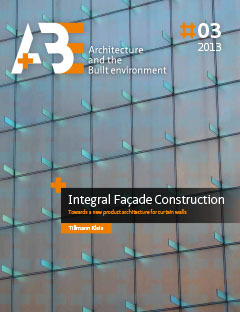 In a next step, future challenges for facade constructions to cope with a changing market environment are identified. A facade function tree is developed and the theory of product architecture is applied to create a comparative basis for analysing different historical and contemporary facade products and systems. The function tree as well as the analysis clearly show how the fragmented market structures has influenced contemporary facade construction and leads to extremely modular product architectures. Numerous case studies for a new approach are conducted and summarised in several matrices. The case studies show how different modular and integral constructional strategies can respond to the future challenges. The pros and cons of different facade solutions, their potential for innovation and robustness in terms of market conditions are investigated. The dissertation concludes that a greater diversity of fa.ade types with a more integral construction is needed to meet the sometimes conflicting future challenges. If this can be realised, a greater diversity of more integral design and construction processes will evolve simultaneously. The role of the different stakeholders will change and a new way of educating architects or facade specialists will be required in order to meet the needs of the future building market: Away from a purely application oriented towards a product architecture driven approach, which clearly includes the implications of facade product architecture on the structure of the design and construction process.